This holiday season Ace Hardware invites you to round up your total to the nearest dollar and donate your change to Renown Children’s Hospital, your local Children’s Miracle Network Hospital. 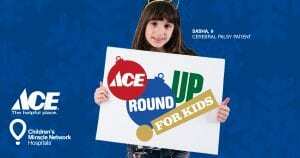 Visit your local Ace and Round Up for Kids! Previous post: From NICU to Nothing Can Stop Him.